Colonel Ossen D’Haiti is a U.S. Marine Officer currently assigned as the Marine Military Advisor to the Director of Net Assessment, Office of the Secretary of Defense. He is a graduate of the United States Merchant Marine Academy in Kings Point, New York where he earned a Bachelor of Science in Marine Engineering, a U.S. Coast Guard License as a Third Engineer (unlimited), and a commission in the United States Marine Corps. He holds a Master of Arts degree in National Security and Strategic Studies from the U.S. Naval War College, a Joint Professional Military Education certification, and was a Seminar XXI Fellow of the Massachusetts Institute of Technology, Center for International Studies for Foreign Politics. He has been selected for the rank of Colonel. Colonel D’Haiti is a Naval Aviator who has flown over 150 combat missions during Operations Joint Endeavor and Guardian Retrieval in 1996, Operations Enduring Freedom and Anaconda in 2002, and Operation Iraqi Freedom in 2006-07. Additionally, he has completed numerous staff assignments and worked with headquarters performing the duties as an Analyst for the Secretary of the Navy, Commandant of the Marine Corps, and the office of the Secretary of Defense. 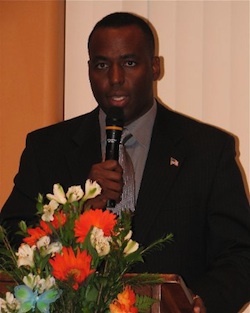 Born to Haitian parents in the United States, Ossen has maintained a bond with his ancestral background. He volunteered his services to HMP after selecting the organization for his Combined Federal Campaign donation in 2009. Reverend Constant’s invitation to join HMP and further its mission was openly received when Ossen formally joined its ranks about a month before the devastating earthquake in January 2010. 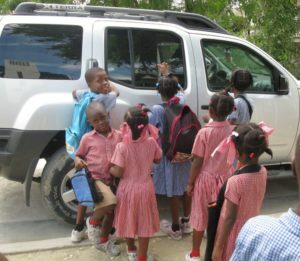 Ossen has maintained his involvement with HMP and was a contributing member for the successful water purification project in Mirebalais, Haiti completed in 2011. He has recently volunteered to serve as the Committee Chair for the HMP Short and Long Term Planning Committee. 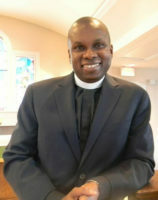 Ossen is a member of Our Lady of Good Council Catholic Church in Vienna, VA but also considers St. Gabriel Catholic Church in northwest D.C. his faith home. It was at St. Gabriel that he got engaged to and married the former Maxine Hall of Sharon, MA. Maxine and Ossen have three children.